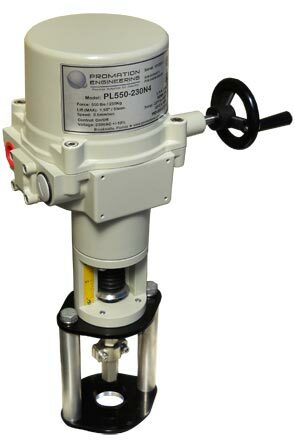 Designed for use on rising stem globe control valves, PL Series actuators provide up to 4400 lbs. (19,600N ) of force and up to 3.9” (100 mm) travel – much greater than other competitive electric linear actuators. This increased up and down force allows use of a globe valve for increased flow control in higher pipe diameters with higher close off pressures versus use of a corresponding butterfly valve with less flow control and lower close-off pressures. Field Selectable Travel Stops – travel stops can be set by location within the stroke or by the rated force at the end of the stroke. On/Off/Floating - Proportional Control – precision proportional control is achieved through an improved microcontroller that has 4-20mA or 2-10VDC input and feedback, AutoCalibration, and flashing LED diagnostic indicators. Customizable Mounting System – a PEI-designed linkage system that is easily configured to various valve bonnets and stem heights. Manual Override – a standard disengagable manual override that allows fast and simple manual positioning of the valve. Standard Voltages – actuators are compatible with 24VAC, 24VDC, 120VAC, and 230VAC power supplies. ProMation Engineering is developing new products as well as improving its existing product line to provide industrial grade products for critical flow control applications where the costs of process interruption far exceeds the cost of the control equipment. Sample applications include precise control of cooling water flow in large globe valves for data centers, control of quenching water in continuous steel production where rate of water flow determines the crystalline structure of steel, control of solutes in pharmaceutical processing, control of cooling water for marine engine operation, large diameter damper control for scrubber systems and many more. For more information call 352-544-8436, Fax: 352-544-8439, E-mail: info@promationei.com, browse this site, or write ProMation Engineering, 16138 Flight Path Drive, Brooksville, FL 34604.